Nigeria’s UK High Commission is warning Diasporas that there are shortages of passport booklets coming from Nigeria and essentially if you have – or are about to apply for a new passport – expect a 3-month wait. The commission added that it is a temporary measure and once situation changes, people will be notified. Other options have been made available i.e emergency travel certificates or visas, and a link to check if your passport is ready has also been provided. 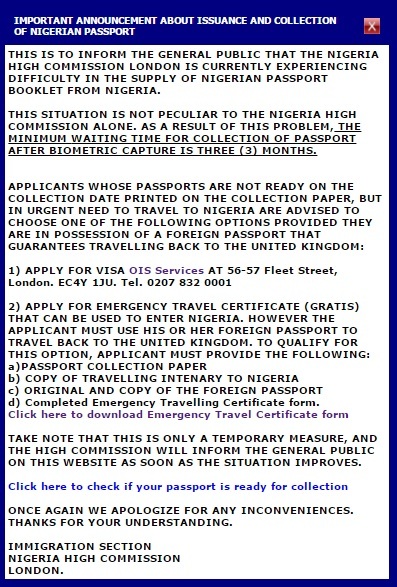 UK Nigerian 3-month temporary wait for Nigerian Passports to the UK due to shortages Bookmark the permalink.